Who Is British Airways Executive Club Good For? If you take a lot of flights around America (North, Central or South), Avios may be the best program for you. Because of its close partnership with American Airlines, you can use Avios to book pretty much any American flight for a fraction of the miles, since the Executive Club uses distance-based awards rather than zone-based awards. Even better, the Executive Club offers you the option to stretch the value of your miles further with multiple Avios + Money redemption options for any itinerary. As with many hotel redemptions, this can be a great way to extend the life of your points, especially since most of the cash contributions amount to a very reasonable 1.1-1.4 cents per mile. However, Avios also incur some of the highest fuel surcharges out there when used on transoceanic flights. While there aren’t a lot of great options for co-branded credit cards, since you can transfer both Chase Ultimate Rewards and American Express Membership Rewards to the Executive Club, it’s easy to get points when you need them. How Can You Use British Airways Avios? Avios are ideal for short domestic hops. Rather than paying 25,000 miles for a round-trip flight (whether you’re flying from Seattle to L.A. or Seattle to D.C), you’ll pay as low as 15,000 round-trip Avios. And BA has no last-minute booking fees, as the main domestic airlines do. So rather than paying 25,000 miles + $75 in close-in booking fees, you’re looking at as little as 15,000 Avios round-trip for the same domestic journey. One of the wrinkles of booking with Avios, however, especially on longer itineraries, is that your redemption rate is determined by adding the points required for each segment of your journey. So if you are flying to Asia and stop in London and the Middle East along the way, your ticket will be billed as if you booked separate flights from the U.S. to London, London to Jordan, Jordan to Delhi. 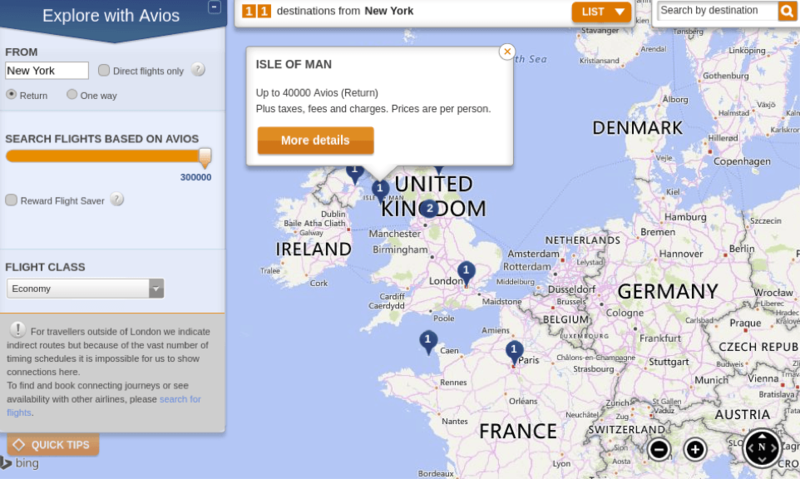 If you want to put together a complicated intraregional itinerary though, Avios can be useful. For U.S.-based travelers, short domestic flights on American Airways or Alaska Airways with Avios are the best redemptions you’ll find domestically with any frequent flyer program. For short hops of up to 650 miles, like New York to Miami or D.C. to the Caribbean, you’ll pay 4,500 Avios each way, and flights of 651 to 1,151 miles will run you 7,500 Avios each way. Only American flights can be booked online; you’ll have to book Alaskan Airways flights by phone. Going to Asia and Australia, you can also use the distance-based award chart to take a stopover in Hawaii that actually saves you a significant number of Avios. Los Angeles to Sydney would run you 50,000 Avios each way. But stopping in Hawaii gives you two segments totaling 37,500 Avios one way, for a total savings of 25,000 Avios round-trip. That’s nearly three short domestic round-trips. Using Avios for British Airways flights is actually the worst way to redeem them. BA is notorious for its fuel surcharges on its own flights, but it also levies them on a number of partner airlines, including American flights to Europe and Asia, Finnair and Iberia flights to and within Europe, and flights to and within the Middle East and Asia on Cathay Pacific, JAL, Malaysia Airlines, Qatar Airways and Royal Jordanian. Generally, Avios are a bad bet for long-haul flights. Depending on the stopovers, you’ll usually run 100,000 Avios or more to head to Asia, and then you’ll pay hundreds of dollars in fuel surcharges on top of that. Upgrades are only available on American Airlines, British Airways and Iberia planes, and even then, only within certain fare classes. 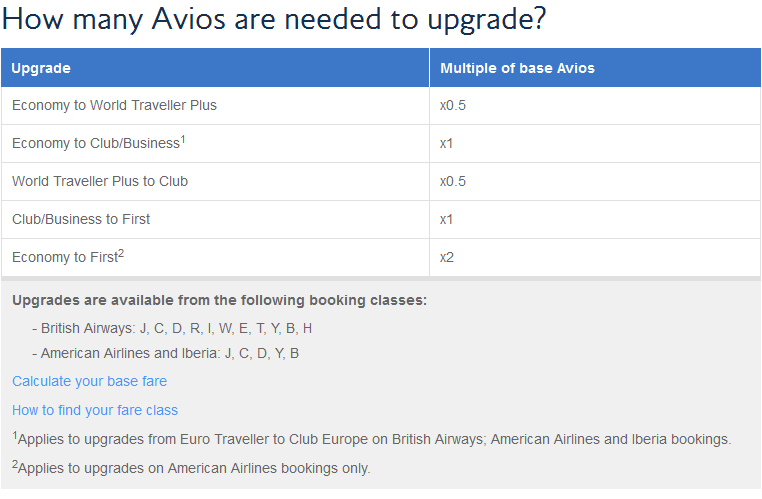 As with all flight redemptions with BA, the number of Avios required for an upgrade depends on the mileage flown. Awards for business and first class are always two or three times, respectively, the number of Avios needed for an economy fare. You also pay hefty fees for the privilege. One perk: If you buy a cash ticket and upgrade with Avios, you’ll earn miles on the upgraded ticket fare class. The British Airways Visa Signature® card is essentially the only card dedicated to earning British Airways Avios. The typical bonus is 40,000 Avios after spending $2,000 in three months, though there is often an offer for 50,000 Avios or occasionally an offer for 50,000 Avios after your first purchase and 100,000 Avios after spending $20,000, which is close to the requirement for the companion pass, available after spending $30,000 on the card in one calendar year.